Folk Art meets Gut Art! So, at the beach a few days ago, up popped these few ladies. I'm calling them the "Six Sisters of Serendipity." Oh, yes, I know they don't have faces. Faces are hard, hard, hard for me. I can do them, but it takes me forever... so I'm trying to convey personality by the tilt of the head, or by the style of their outfits. Then, playing around with some folk art paints... I wasn't really painting on a rubber tub. I stopped at Joann's on the way camping and picked up a huge book of papers for less than half price. So, clothing these three ladies was like playing paper dolls... except I was battling against the ocean winds! Mytelle would grunge these up a bit I'm sure... but then, I also liked the clean, crisp, folk artish look. Actually, it was all very intentional, not so from-the-gut, but Mystele has helped me learn to loosen way up! Then, yesterday was a wonderful dinner out with friends, celebrating both Kathleen and Darleen's birthdays... both are dealers in my shop, so it was a fun afternoon creating their gifts. I love playing around with the papers to create interesting outfits. I took a photo of our shop, taken during the 4th of July parade, and created their destination. To save time, I printed their little blurbs on my computer. Both friends loved their paintings, but I had to bring them home to put the hangers on. Art Journal - Visual Journal - Art on the go! I am just loving my little art journal. It goes everywhere with me, along with my teensie-tiny little watercolor box and travel brush that has water inside it! I never have to fool with pouring, carrying or messing with water! The whole little travel kit fits snugly in my purse so I can pull it out when ever. There are several great books and wonderful teachers who offer amazing techniques for Visual Journals... but I kinda like the niche I'm in. I just like to capture my thoughts and responses to both what I see and how I feel. I found that once I got my materials together, it actually comes quite easy. Of course, I'm not doing allot of cutting and pasting, mixed media and all... just simple pen and watercolor. And this was done in the middle of the night before my trip to Yosemite. I was so excited, I couldn't sleep! Being a doodler... I like that my pages don't always have to be serious, or even about me trying to duplicate something I see. Actually, David Deyel, my last Yosemite Art teacher, said he never tries to paint details, because he's NOT A CAMERA. I love that! I like the idea of painting what my feelings are responding to, rather than mimic details. But, I wasn't looking at anything... just doodling here..... pure fun. Not much I can say. This was an amazing campsite! I never put the top on my tent... with the full moon I could bathe in Moonlight all night long. Sounds of the surf, fog horn sounding every 10 seconds, seals barking at each other, and the seagulls calling. I was in bliss. I am so thankful for the opportunity to appreciate this beautiful planet. Got a little bit of art work done, but mostly read and wrote. Did do some fun art/journal entries. I'll share those soon. Tomorrow I'm leaving on another mini self directed art retreat. Then school begins a week from today!! Taking a mixed media class, so I really needed to spiff up my studio. Took out the tall and big easel, since I like to work off a desk. Also, took back the fab art table since my honey wasn't using it. Thank God for Honey though!! Here he is putting up one of about a dozen shelves! Freshly cleaned off... now that I have a place for most things! This is my dad's old desk. The fabulous glass art desk! and I'm using the three shelf vintage kitchen cart. I can get ALLOT of stuff on there. I gave up the taboreh thingy... Liked the idea of it, but my granddaughter loves it more (for her hair stuff)! An old fruit crate, painted white makes a great shelf. The cart with the pens and pencils pulls out to access the one in the corner. My computer has a safe place now, instead of teetering on top of a pile of canvases. More shelves, and more work surface for mixed media stuff. A peek around the other side... even hung some of my practice/fun pieces. Here's a look at the table top we picked up for $2 this weekend! My containers break down and fit nicely underneath. So here's the long view... a cleaned up space, just waiting for my inspirations and creations! Last note... notice the red tubs. I picked up eight of them for 50cents each!! So great for storage! Tomorrow I am off to my ocean front campsite at Bodega Bay. Been visioning that for the last two weeks! Hoping for more sun than fog... but also looking forward to the fog horn and seagulls! I'll see if I can post a movie clip. I've just got to post these fabulous pics of Yosemite. I'm so excited, with my Senior Golden Pass, I get to return to Yosemite again and again, for FREE!!! Plus, I just booked three nights in September in Tuolumne Meadows, and a beautiful campsite in the valley, right under Half Dome for another three nights in Oct. I feel so rich! Early in the morning, NO ONE is in the parking lot.... I LOVE IT!! The MISTY MORNING VIEW from the tunnel. Amazing El Capitain, in the early morning light. I've been coming to Yosemite since the 1950's, remembering the FIREFALL! Camp Seven and the Stoneman Bridge, when there were no designated campsites... you just pitched your tent along the river. At night we would yell out "ELMER"... and then about 9:30 we'd hear "Let the Fire Faaalllllll", and a beautiful cascade of glowing red embers would give us a beautiful fireworks show from Glacier Point. It's always so wonderful to return, again and again. so you can imagine how thrilled I am to have a LIFE TIME PASS!! Anyone else have memories of Yosemite?? Just got back from an amazing art retreat in Yosemite. Actually, I camped (by myself!!) at Bass Lake and drove into Yosemite for my art time. The Art Center offers wonderful art lessons by professional artists from all over the state. David Deyell was the teacher of the week... a talented and fabulous teacher. I learned so much from him... especially giving "permission" to use black. 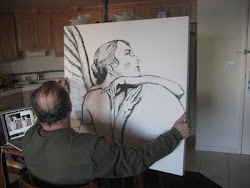 David uses one flat brush and utilizes all it's sides and angles. He loads his color on the brush and mixes colors on the paper, not the pallet. He gets clear, bright colors by placement of complimentary colors, yellows against purple, red against blue or green, etc. I'd take a class from David again anytime!! I'm so proud of myself, to go off camping by myself. I kept questioning: am I 19, 44, or 63! Turns out, 63 is great because they gave me a life long pass to all National campgrounds!!!! Bass Lake is amazing and beautiful, but full of families and boats. It wasn't the serene camping experience I was looking for... but beautiful, none the less. Finally, I can't resist showing you this piece of inspiration. My cousin Joanie gave me this camping coffee pot many years ago. She had a special thing about using vintage items when camping. Joanie has been gone now for more than 10 years, but I feel her presence and legacy in moments and things like this. Look for some art inspired by this coffee pot. Maybe a folk art painting of the pot, with some sort of image reflecting in the body?